I’m not entirely sure how or why, but I’ve ended up upgrading most of my electronics over the past few weeks. I’ll going to do a short series of blog posts on the different choices I made, why, and some first impressions. First up — a new backup and wireless solution. This bout of upgrade mania all started with a full backup drive. I had been using a 2009-era Apple Time Capsule and have been super happy with it. But it’s only got 1TB of storage. Our family has a few Macs, about 10 iDevices, and an SLR which together have generated 400GB of photos and videos in the past few years. I was spending a lot of time tweaking backup settings to deal with the reality that the drive just wasn’t big enough. 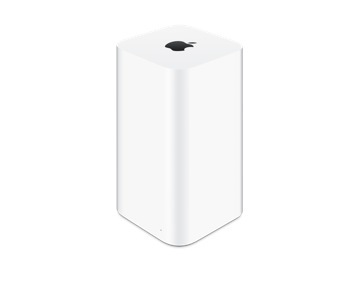 When Apple released a new Airport Time Capsule this summer, I thought it looked gorgeous and its vertical design might help declutter our office. Plus, I’d decided to switch over my Time Machine backups to encrypted so needed to start over anyhow. It was time, so I ordered a new 3 TB Airport Time Capsule. Why I chose it: I’ve loved my existing Time Capsule and its Mac integration, reliability, and solid wi-fi. I didn’t consider any other models. I was happy to get the new design, bigger storage, newer /faster 802.11ac wi-fi (which will be much faster than our existing 802.11n which matters for doing backups). Also, I absolutely love the word “beamforming” which Apple uses to describe the antenna’s directional abilities. First impressions and surprises: After trying a few different physical locations in our home office, I didn’t love the looks as much as I thought. It was ungainly and tall (like I was as a teenager). It occurred to me to put it in my TV cabinet in our living room rather than in the office. It ended up working like a charm, not only eliminating clutter from the office but improving wifi around the house because my living room is a more central location. This approach allowed me to retire an old gigabit ethernet switch, eliminating one device from the clutter that is my entertainment center. Up next: to upgrade TiVo, or not to upgrade TiVo?